Remembering two long-standing members of the choir, who sadly died last year. Angela Thomas. Alto. One of the founder members of the choir, joining on 17th January 1989. To quote a long-standing friend: "Wonderful personality. Her recollections of her time as a private nurse in the 60s and 70s were fascinating to hear. She was gorgeous to look at and I can imagine she had a whale of a time. She was certainly on set with Michael Caine at one time, but her exploits and adventures were hilarious. She also had a stint looking after the eccentric elderly owner at Leeds Castle." And after the funeral: "What a beautiful occasion - the wonderful flowers, a church full of loving family, friends and dogs, a carefully crafted and composed tribute from Paul (reminding us all of Angela's amazing reading voice too), together with the privilege of singing favourite anthems to our dear friend. And afterwards, Lukesland, a perfect venue and a time to fondly go over the many happy memories we have of a extraordinary lady. Her tales will live on but we shall miss her." To sum up for the choir, we shall especially remember her for her beautiful voice, love of fun, bluebells and her superb cream teas. Edward Morgan. Tenor. Edward was a talented man whose life experiences were incredibly varied, from guarding the BBC station at Start Point as a member of the Home Guard, aged 17, through farming, to the building trade. He played cricket and rugby, but singing was his great passion, starting to take it seriously in his twenties becoming a founder member of the Kingsbridge Singers and later joining the Alvington Singers in our very early days. He sang many tenor solos and won several prizes with his fine voice, continuing to sing with us until his illness made it too difficult to continue. A lovely man with a super sense of fun. Our recent concert in Buckfast Abbey was very well attended despite the wild and stormy weather. The Little Jazz Mass by Bob Chilcott was especially well received and the choir enjoyed performing with the jazz trio. We are always warmly welcomed in Buckfast Abbey and we look forward to performing there again in 2019. How all our hard work paid off! Two memorable concerts - " The choir soared, the quintet flew and Tim is probably still up on the church roof!" The audience feedback is all more than positive, very complimentary, in fact: "Going from strength to strength." "Onwards and upwards!" 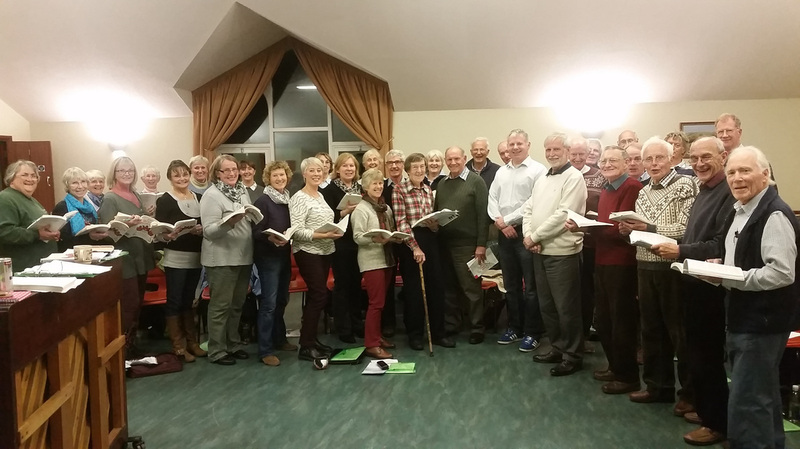 "It was a superb concert - particularly enjoyed the Sunrise Mass which was sung superbly." The rehearsal this evening was very special. We not only celebrated 30 years of the Alvington Singers, but also said thank you and "au revoir" to three members who have left the choir recently. Anne presented Dee, Angela and David S each with an engraved wine glass and we all enjoyed nibbles prepared by the basses, some (non-alcoholic) fizz and a superb 30th birthday cake, cut by three founder members. ​Alastair Durden, our Musical Director until Christmas 2013 also joined us for the occasion. A real party!